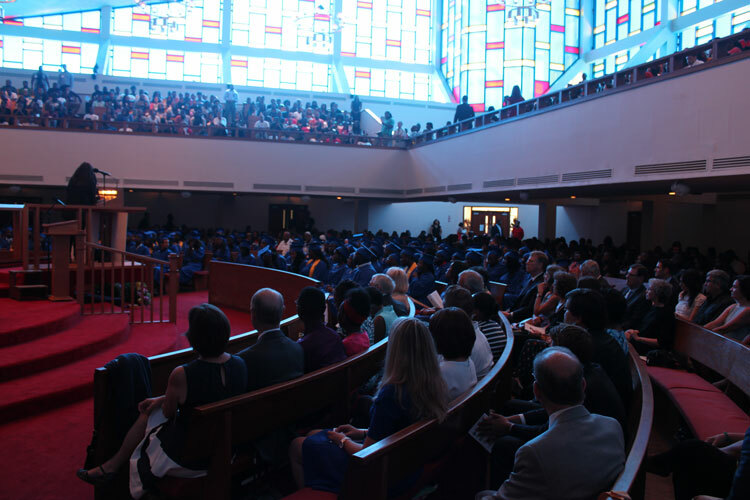 Last Friday, 118 YouthBuild students graduated in front of friends and family at a ceremony held in Zion Baptist Church’s sanctuary on North Broad Street. Hundreds of guests attended, as well as Class of 2016 applicants going through Mental Toughness Training. At the ceremony, we were pleased to award scholarships to fifteen students thanks to individuals who gave to the Class of 2015 Scholarship Fund and to specific named Scholarships. 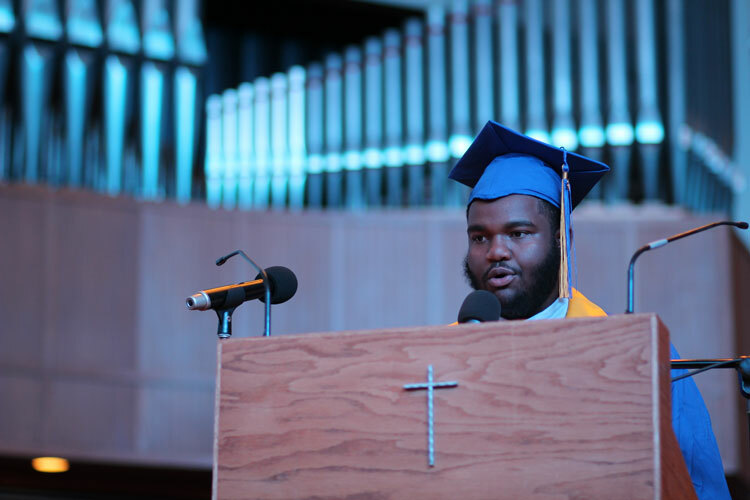 The Young Friends of YouthBuild Philly raised an entire scholarship at a fundraiser last month, which went to Anthony Parkinson. Gregory Brewer received the John Gallery Leadership Award and Scholarship. The family of Steven Lawrence – a former YouthBuild student who was killed in 2006 – also raised funds for scholarships, which went to Maxwell Hough, Kalee Jordan, and Mercedes Orrell. 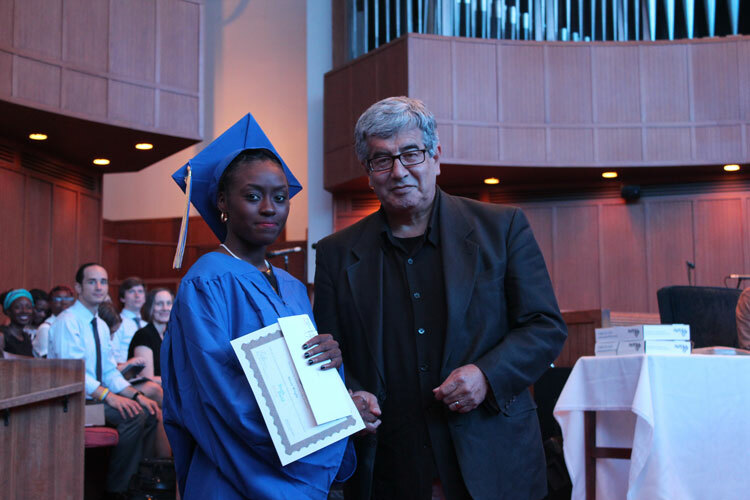 Eight more graduates received scholarships named after founding board member John Rosenthal. 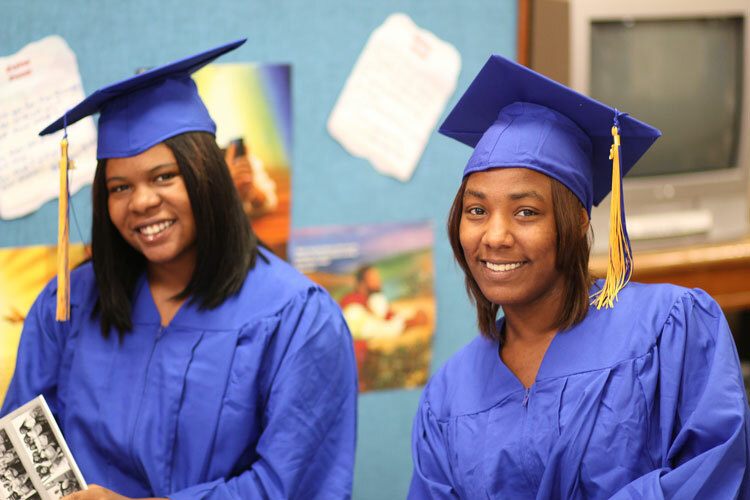 Additionally, some YouthBuild donors made brand-new scholarships possible this year. The first-ever Philotimo Scholarship, created by Dr. George Tzanis, went to Kristina Robinson and the first Dr. John Hewlett, III Scholarship created by Bill and Gail Tomassini went to Alexis Wright. Erica Atwood, Director of Black Male Engagement at the City of Philadelphia, delivered the commencement address to the graduates, calling on them to know their worth and to own their stories of struggle and success. We were honored to feature Erica, who works tirelessly to reduce economic and social disparities in the city, in this year’s program. A lot of us here today have faced obstacles and challenges during the year. Have you ever tried to shovel a path while it’s still snowing? Every time you shovel, more snow gets in your path and eventually you get tired. Life can feel that way. It can make you profoundly tired. A lot of us know the feeling. But with a little bit of salt on the ground, we can make it through. That salt is your grit. That salt is your support system. That salt is one more push. That salt is believing in yourself, no matter what, and staying true and focused on your goals. For me, the challenge was not to let anything – or anyone – distract me from my goals. I resolved to stay self-motivated, and when I got used to avoiding distractions it got easier over time, like the snow was melting around me. To the class of 2015 and incoming class of 2016, my advice to you is to stay focused. You’ve made it this far, don’t let anything or anyone cause you to throw it away. The other two student speakers were Salutatorian Nicolette Grant and Valedictorian Kristina Robinson. Nicolette described her journey to YouthBuild, and how she overcame the high hurdle of her own self-doubt. Even when I was invited to Mental Toughness I still had doubts in my mind. I was worried about the sacrifice I was going to make to attend school, like not working anymore and not having money. I set my doubts aside, however, and decided to be resourceful. I woke up early. I was motivated to keep going all year because I knew why I wanted to succeed. I wanted to give my family a better future. I never lost sight of that. Over time, I stopped focusing on my limitations and started focusing on my motivations. I would like to give a shout out to the Child Development Associates for deciding to make a difference in tomorrow’s youth. Shout out to Advanced Construction and Building Maintenance for rebuilding something broken into something far more beautiful. Shout out to Healthcare for being brave enough to save lives. Shout out to Greenbuild for changing the world into becoming more energy-efficient. I saved the best for last: My cluster, which I am so proud to be a part of. Shout out to the Business Administration Scholars for having the courage to become business owners and their own bosses someday. I would also like to shout out the YB staff for deciding to change the lives of many high school dropouts that the world pretty much gave up on. Shout out to our sponsors, who allowed this dream of faith to become reality. Shout out to all the support systems, the family and friends that each and every one of us, the class of 2015, had to rely on. Shout out to all the tears that were shed this year that made us stronger men and women. The stronger men and women of YouthBuild are now embarking on their “Year 2” journey of employment and/or further education, with continued support from YouthBuild staff. We are planning a series of interviews with our alumni, so this won’t be the last that you hear from the Class of 2015. Stay tuned! In the meantime, check out our Facebook page and the hashtag #ybphilly for photos and posts from the event. Previous Post Building a Student Lounge with IKEA South Philadelphia!